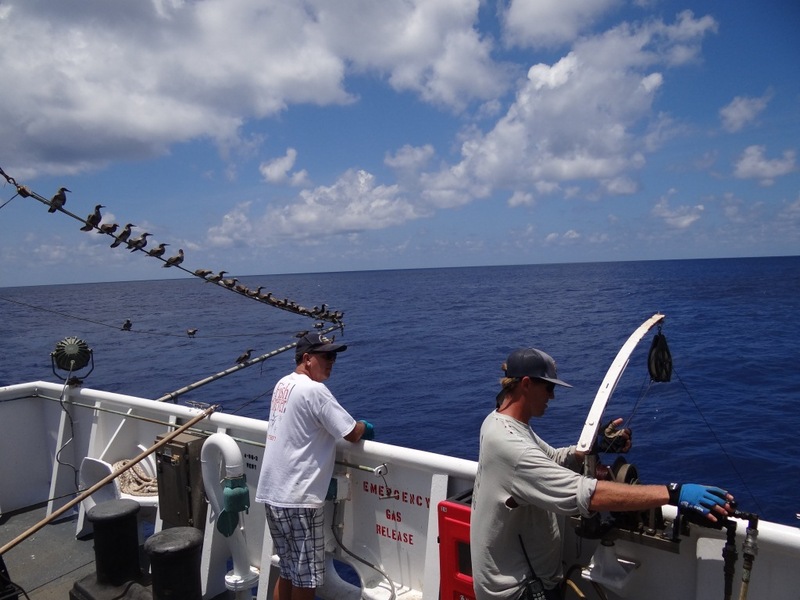 ← All in a day’s work: PIFSC SE-13-07 “Deep -7” Bottomfish research expedition blog. Aloha to the Pacific Remote Island Marine National Monument waters of Johnston Atoll. 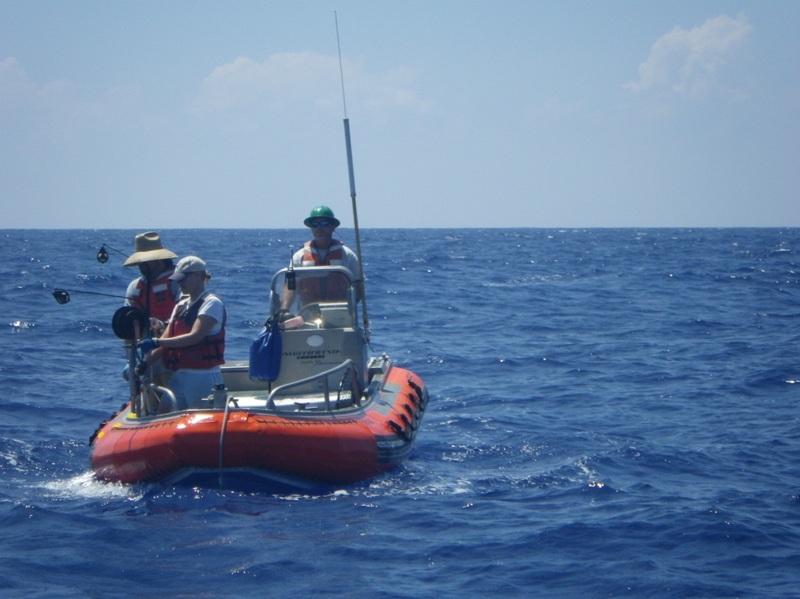 The sampling objectives have been accomplished and the scientists and crew onboard the NOAA Ship Oscar Elton Sette and are heading home. 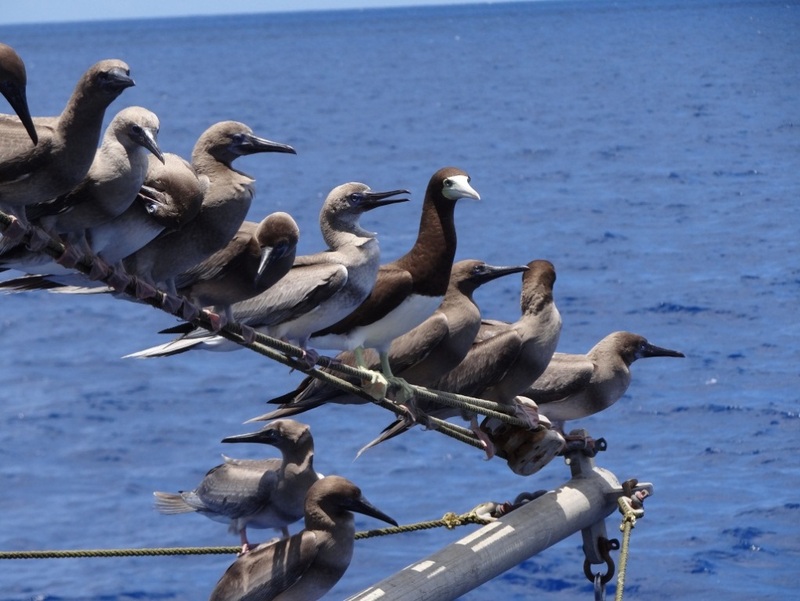 The bird colony (comprised mainly of Boobies) from Johnston Atoll Wildlife refuge provided frequent companions for us and have provided a running commentary on our sampling techniques. 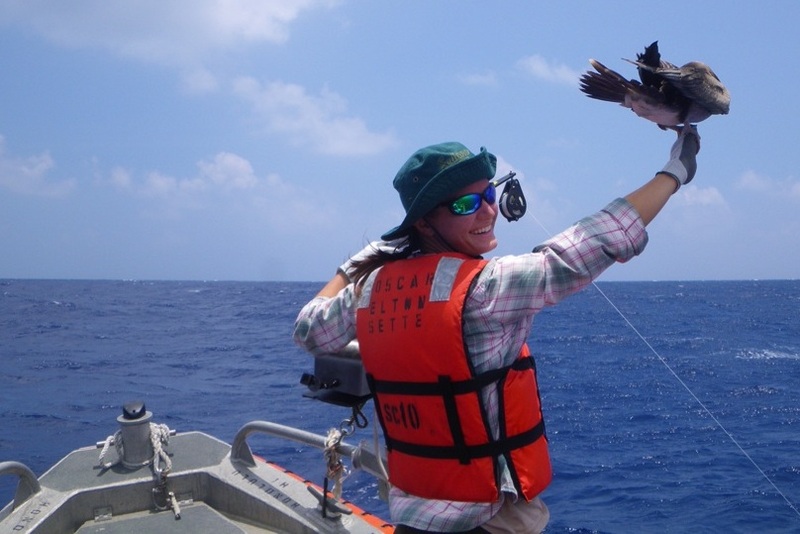 • conducting ocean measurements to characterize the physical environment that pelagic stage bottomfish may be associated with. These samples, once analyzed, may lead to a better understanding of the environmental habitat of the bottomfish under investigation (these bottomfish species include the Hawaiian grouper “hapu’upu’u” and six species of deep-water snappers (“opakapaka”, “ehu”, “onaga”, “lehi”, “gindai”, and “kalekale”) and provide an understanding of the extent that populations between Johnston Atoll and the Hawaiian Archipelago are interconnected. Small boat crew finishing up sampling operations prior to departure. The Henry Ching reel seen attached to the front right of the boat is operated using a 12volt battery and allows for sampling at over 1000 ft depth. 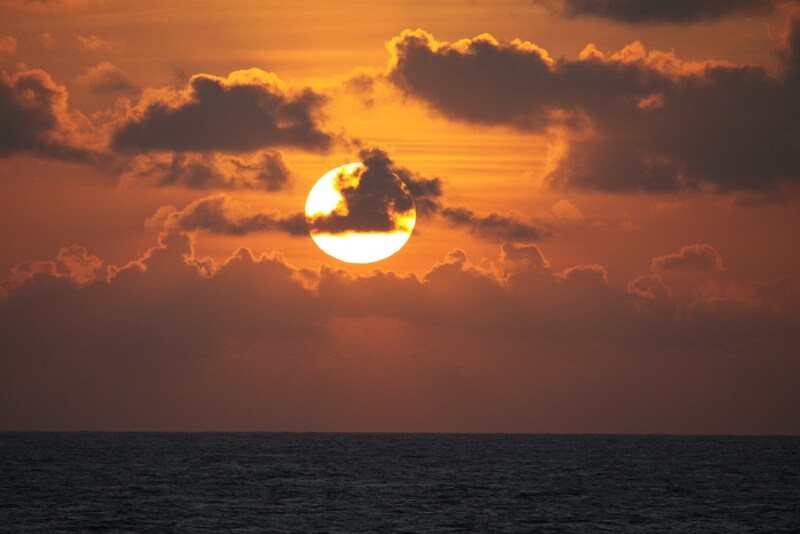 Some of the major factors that play a role in primary productivity include ocean temperature, dissolved oxygen levels, and salinity. These contributing factors along with light availability and nutrients such as nitrates, phosphates, and iron influence the amount of chlorophyll or phytoplankton productivity in a given area. 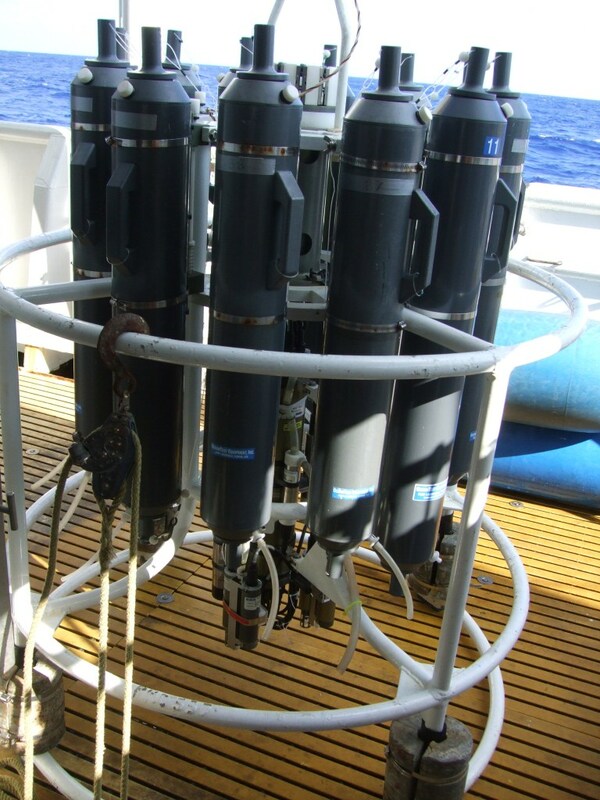 Measuring the amount of chlorophyll production coupled with ocean temperature, oxygen levels, and salinity along a depth gradient gives us an idea of how productive the area is and where it is occurring in the water column. This entry was posted in Fisheries Research and Monitoring, Scientific Operations and tagged ADCP, bottomfish, Cassandra Pardee, chlorophyll, Cobb, connectivity, cruise, CTD, Deep-7, DNA, Eddie Ebisui III, ehu, Eric Breuer, Eric Mooney, fin-clip, Fisheries Research and Monitoring Division, gindai, hapu'upu'u, Hawaii, Hawaii Pacific University, Hawai`i Institute of Marine Biology, Henry Ching reel, Johnston Atoll, Justin Kantor, kalekale, lehi, Louise Giuseffi, Marine National Monument, Meagan Sundberg, oceanographic, onaga, opakapaka, Oscar Elton Sette, otolith, Pacific Remote Islands, PRIAs, Robert Humphreys, Robert Spina, Science Operations, SE-13-07, Tommy Knowles, trawl, water chemistry. Bookmark the permalink.